As iron heats up, the arrangement of its atoms changes several times before it melts. This odd behavior is one reason why steel, in which iron plays a big role, is so sturdy. It also explains why we use steel for everything from teapots to skyscrapers. New research offers evidence for how iron’s magnetism plays a role in this curious property—an understanding that could help researchers develop better and stronger steel. “Humans have been working with regular old iron for thousands of years, but this is a piece about its thermodynamics that no one has ever really understood,” says Brent Fultz, professor of materials science and applied physics at Caltech. The laws of thermodynamics govern the natural behavior of materials, such as the temperature at which water boils and the timing of chemical reactions. These same principles also determine how atoms in solids are arranged, and in the case of iron, nature changes its mind several times at high temperatures. At room temperature, the iron atoms are in an unusual loosely packed open arrangement; as iron is heated past 912 degrees Celsius, the atoms become more closely packed before loosening again at 1,394 degrees Celsius, and ultimately melting at 1,538 degrees Celsius. Iron is magnetic at room temperature, and previous work predicted that iron’s magnetism favors its open structure at low temperatures, but at 770 degrees Celsius iron loses its magnetism. However, iron maintains its open structure for more than a hundred degrees beyond this magnetic transition. This led the researchers to believe that there must be something else contributing to iron’s unusual thermodynamic properties. When coupling these vibrational measurements with previously known data about the magnetic behavior of iron at these temperatures, the researchers found that iron’s vibrational entropy was much larger than originally suspected. In fact, the excess was similar to the entropy contribution from magnetism—suggesting that magnetism and atomic vibrations interact synergistically at moderate temperatures. This excess entropy increases the stability of the iron’s open structure even as the sample is heated past the magnetic transition. The technique allowed the researchers to conclude, experimentally and for the first time, that magnons—the quantum particles of electron spin (magnetism)—and phonons interact to increase iron’s stability at high temperatures. Because the Caltech group’s measurements matched up with the theoretical calculations that were simultaneously underway in the laboratory of Jörg Neugebauer at the Max-Planck-Institut für Eisenforschung GmbH (MPIE), Mauger’s results also contributed to the validation of a new computational model. “It has long been speculated that the structural stability of iron is strongly related to an inherent coupling between magnetism and atomic motion,” says Fritz Körmann, postdoctoral fellow at MPIE and the first author of the computational paper. 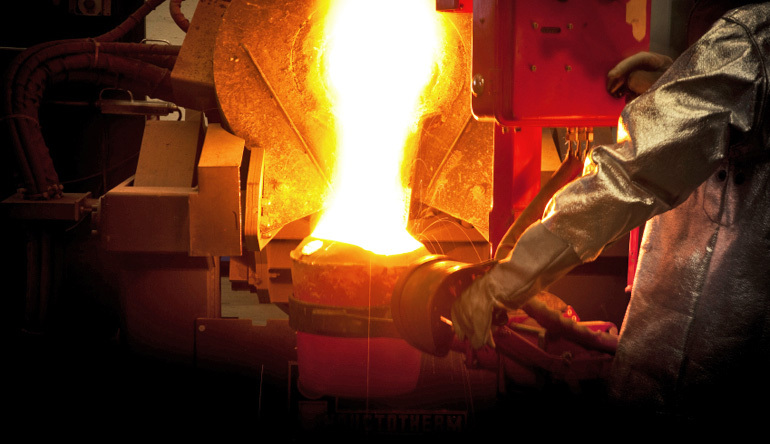 For thousands of years, metallurgists have been working to make stronger steels in much the same way that you’d try to develop a recipe for the world’s best cookie: guess and check. Steel begins with a base of standard ingredients—iron and carbon—much like a basic cookie batter begins with flour and butter. And just as you’d customize a cookie recipe by varying the amounts of other ingredients like spices and nuts, the properties of steel can be tuned by adding varying amounts of other elements, such as chromium and nickel. With a better computational model for the thermodynamics of iron at different temperatures—one that takes into account the effects of both magnetism and atomic vibrations—metallurgists will now be able to more accurately predict the thermodynamic properties of iron alloys as they alter their recipes. The experimental work appears the journal Physical Review B. The computational paper, coauthored by Fultz and Mauger and led by researchers at the Max Planck Institute, appears in Physical Review Letters. The US Department of Energy supported Fultz’s and Mauger’s work.